In this post I’d like to elaborate on a question: Is there a market for a Kindle with larger screen size (I think next logical Kindle screen size would be somewhere in between 7 and 8 inches)? At the moment of this review there are two available screen sizes for Kindle. Small version has 6 inch screen and DX version has 9.7 inch screen. Kindle DX screen is quite large and great for reading text books, magazines, newspapers and books with illustrations. But for other books it could be way too large. Kindle 3G and Kindle WiFi have screen sizes very similar to small paperback books. Kindle 3G/WiFi screen measures to 3.6 in (91 mm) × 4.8 in (122 mm) which is similar to “sixteenmo” page size (the page size of a book made up of printer’s sheets folded into sixteen leaves, each leaf being approximately 4 by 6 inches). It is great format since it is very compact but at the same time it is limited to how much information will fit to one page. Especially this starts to affect your reading experience when you use font scaling. Even though page turn times significantly improved from first generation of e-Ink – this operation is still time consuming and besides pressing next page button also requires moving your sight from right bottom corner of the screen back to left top corner on each page turn. And flash of the screen doesn’t add to comfort either. Thus by using e-reader with slightly bigger screen may lead to less tired eyes. E-readers with small screens may be quite useful for people who read very fast since they can scan through entire lines without moving their sight left and right – since on a small screen you can see entire line in focus. But I think number of folks who can read page diagonally in several seconds is quite limited so I won’t consider this as a significant part of this analysis. Then there is weight and size issue. I highly doubt that increasing screen size by one inch would significantly impact weight. But many people take Kindle with them while travelling and since current Kindle is very compact it could fit in most of the bags – even small ones (on my travels I usually have 17 inch laptop with me so Kindle weight and size is not an issue in my case). So for those who like to carry Kindle in their handbags increasing size of the kindle even by an inch could cause issues. That’s why having two different models may be helpful. I personally prefer to read books in slightly larger format than what Kindle currently provides. So if Amazon would offer version of Kindle with 7 or 8 inch screen then I would definitely purchase it. What about you – do you think that Kindle with larger screen would make any difference for you? This is a guest post from my friend sharing his experience using Sony Reader PRS-505 for 2 years. I recently gave him an Amazon Kindle to test and he agreed to share his thoughts about both of them on Blog Kindle. Even though both devices have been on the market for quite a while lots of people don’t have good idea what are the differences between them from a regular user point of view. Hi folks, this is not going to be an official Kindle vs Sony Reader review so don’t expect professional advice from me – just my impressions. I purchased Sony Reader PRS-505 couple years ago when it just became available. So there wasn’t much choice during that time. Even Kindle wasn’t available back then. I haven’t upgraded it since then – I guess it was enough for my needs so far. Right from the beginning I wan’t to post a disclaimer that since I used Sony Reader a lot I know lots of its negative and positive sides and I just had Kindle 2 for several days which was not enough to get complete impression of it. So consider my post as Sony Reader PRS-505 review with side comments about Kindle. 2 years already passed and device is still functioning. Our Sony Reader was used for 2 years in quite harsh travel conditions and I still can read on it. I read on Blog Kindle that Kindle devices have a tendency to die during air travel. My Sony Reader survived lots of air trips. It can read PDF files (I know lots of other readers can do it too but back then it was a unique feature). Since I read lots of old books in russian language PDF was the best way for me to transfer books on Sony Reader (I know that there are some hacks may be available to add language support there but encoding book to PDF is easier for me). Until recently I had to use CutePDF printer installed into Microsoft Word to print documents into PDF and it required some skill to make it print to the right page size for Sony Reader. But now there are several sites on internet which provide PDF files with russian books both in Sony Reader and Kindle formats. I can read blogs on it too and for free. Even though it doesn’t have 3G connection like Kindle there is a possibility to read blogs and some websites on Sony Reader and do it free. Well not 100% free because you’ll be paying with headache :). But using Calibre software you can transfer 100’s of blogs to your Sony Reader within reasonable time. You just need to connect it to computer once a day and press Start button. For 20 blogs that I follow it takes 30 minutes. So if you have 3-5 blogs you like to read it will take less than 10 minutes. Negative side of it is when Sony Reader has too much complex information in its storage it will start to freeze during boot. And unfreezing it could take days (I’m not exaggerating here). You need to completely discharge it sometimes to get rid of the freeze. But good moment is that I was able to unfreeze it every time it froze. Before going to negative sides I want to notice that I never upgraded firmware on my Sony Reader PRS-505. So I guess some glitches may have been patched by Sony. But I think 90% of users have no idea what is firmware and how to upgrade it and another 9% know it but have no desire to do it. Dead time while charging: one of the big disappointments with Sony Reader (not sure if it applies to Kindle) is dead time during charging. When it is completely discharged and you want to start reading a book you need to wait for an hour until it actually boots. Before that all you can enjoy is a red light on top of it notifying you that at least something is happening. But it really prevents you from reading when you want – because there is never guarantee that device is charged enough to read. Faster battery drain: While using Kindle 2 that Andrei borrowed me I also noticed that when Kindle 2 is off it doesn’t drain battery while Sony Reader tends to do it and within a week I usually have to recharge it. Maybe it is just my unit but it is definitely a problem. You need to check on it when it is charging: and if you don’t do it you will loose the charge. So here is a story. When you plug in Sony Reader to computer USB port it starts charging and when charge is strong enough to turn on the display it does so. The problem is when display is on in Sony Reader it drains the battery and if you turn off the computer to which it is connected it will start discharging unless you turn it off manually. So every time you charge it you really have to watch it. I would say it is one of the most disappointing problems with it. PDF files problems: Yes it is also a negative side. After 500 page it starts to turn pages very very very slowly… I don’t know what the problem is there but it is better to split large PDF into two files rather than wait for 2-3 seconds for a page to turn. Freezing on complex stuff: When I tried to upload 30 blogs from Calibre it started to have boot problems from time to time. Couple times I thought that we lost it. Weight is about the same. Kindle feels slightly different as it is thinner but wider and longer. Not much difference in display quality. 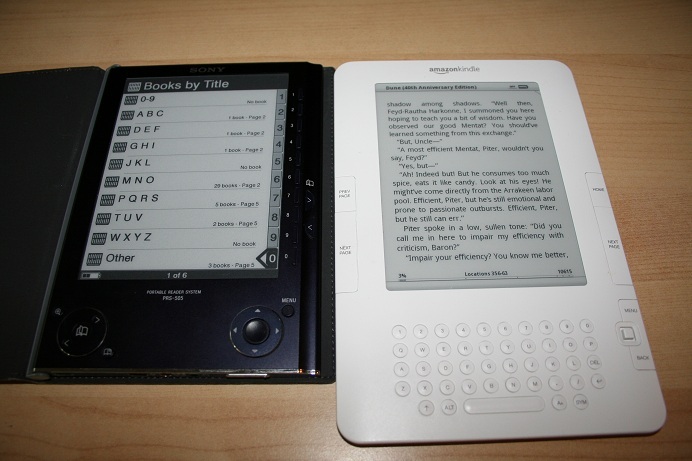 Both eInk screens look the same to me in size, contrast and readability. One of the main reasons why I borrowed Kindle 2 from Andrei was its dictionary support. My wife studies English and she needs a dictionary while reading English books. With Sony Reader I haven’t found any solution to on screen dictionary. I know that Sony has a touch screen version now but I weren’t able to confirm that it has a dictionary. Kindle 2 has a great feature where you can move the cursor to the word on the screen you want to translate and you’ll see a translation within a second. This makes Kindle 2 a clear winner for our next purchase unless some reader could do it cheaper or better. I also learned that you can send files that you want to read right from your computer to Kindle devices. This is a great feature even though I was a bit disappointed that I need to pay 15 cents for each transfer. Wireless charges. I get this negative impression from almost every modern device like iPhone, iPad, Kindle. They all charge me for 3G traffic. It is more or less ok for me to pay $30 for unlimited traffic on iPhone. But I don’t want to pay additional $30 for iPad and then more dollars to read blogs on Kindle. I want a single unlimited data plan that I purchase from wireless provider like AT&T, Verizon, T-Mobile, etc. that could be used for any 3G device I own. Unless they will figure out how to do it 3G option will be a nice but rarely used feature for me on such devices. Here is all that I can say about both devices so far. Once I get more time with Kindle I’ll try to write some more.